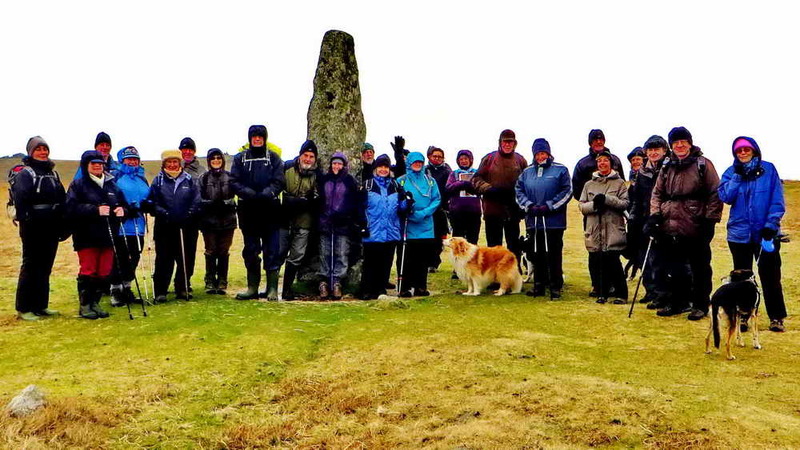 Twenty-eight walkers set off on this second DPA short walk on 25th February 2017. We planned to see the misleadingly named “abandoned apple crusher”, hut circles, two Bronze Age double stone rows that function as a sun calendar with an explanation of solstice and equinox sunrises and sunsets, cists, cairns, stone circle, menhir, Long Ash Pits, the Medieval TA Packhorse Track marker stones, Long Ash Leat and Four Winds – the site of Foggintor School. To illustrate this walk, I am including some photographs from several reconnaissance walks, including visits before dawn and sunset, to better explain the story about the stone rows – although probably more than 4,000 years old, they still function as an accurate calendar. 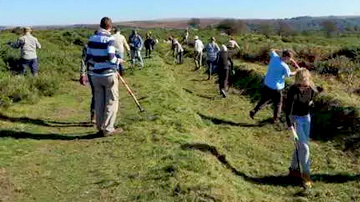 The Merrivale stone rows story is described in the book by Jack Walker (2005), Dartmoor Sun, Halsgrove Discover Series, Halsgrove Publishing, Tiverton, Devon. 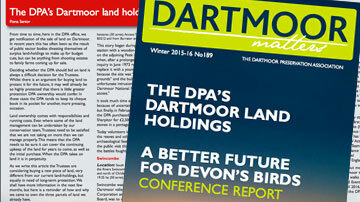 Articles were also published in Dartmoor Magazine, 63 (2001), 67 & 69 (2002) and 71 (2003). This round stonehas been described as an abandoned “runner”, that is, the running wheel that would be turned on an axle pulled by a horse with the stone running edge-on in a circular trough crushing apples for making cider: i.e. 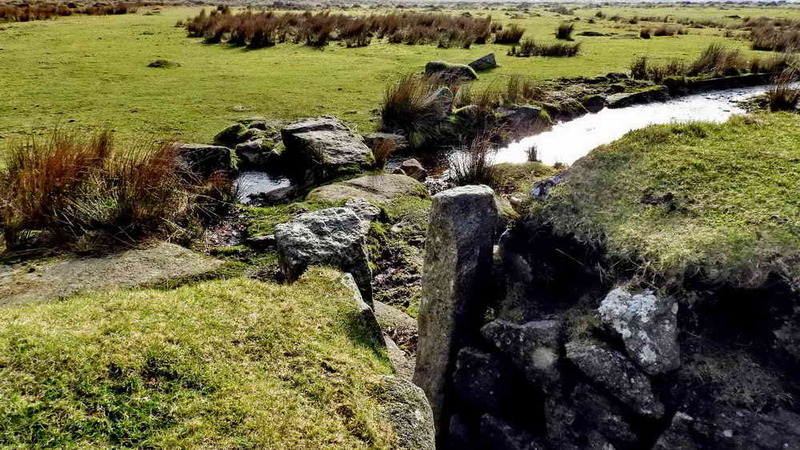 “an abandoned apple crusher.” But ….. William Crossing (1987), Dartmoor’s Early History & Medieval Remains, in Chap. 12 Rejected by the builder, pages 60-64. This material was first published in the Western Morning News and other newspapers in 1905. There was a big story about a dolmen or quoit with a worked capstone but eventually a man was found before any scientific paper was written who pronounced: “Twadn’t no old man cut thacky stone,” he said, “I cut’n.” This is an abandoned top-stone to a crazing mill, an old way of grinding tin ore.before it was smelted. The perfectly domed upper surface makes it unlike any apple crusher or flour millstone? 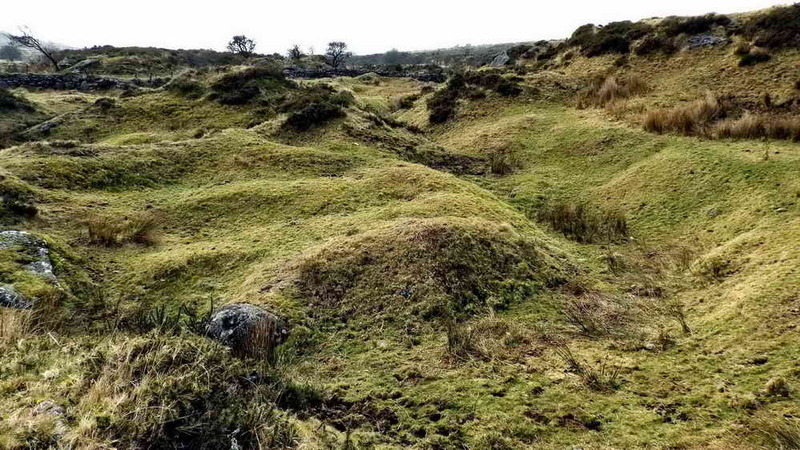 A good diagram of a crazing mill can be found on this page about Gobbett Mine. The east end blocking stone of the northern stone row. NB – both stone rows are double, i.e. consist of two rows of stones about a metre apart. This row has the ruins of a cairn associated with this end. Nearest the camera, the east blocking stone of the longer southern row. Behind, the blocking stone of the northern row. Walkers at the east blocking stone of the southern stone row. 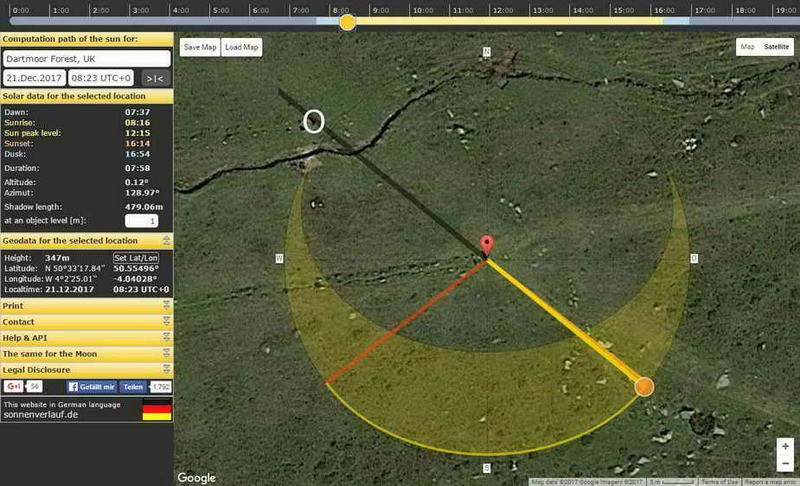 This SunCalc image shows the minute of sunrise on the shortest day (Dec. 21), based at the east blocking stone, southern row (the red pointer), when it casts its shadow directly towards the east blocking stone of the northern row (inside the white circle). These stones also work in reverse for sunset on the longest day – see this video …..
A 1:35 minute video showing sunset on June 21, the summer solstice or longest day, based on the east blocking stone, northern row, where its shadow is cat straight towards the east blocking stone of the southern row at the minute of sunset …..
Feb. 6th sunrise. Note that to observe the sun rise over the east blocking stone, southern row, it is necessary to have moved to the right (i.e. west) of the position in the sunrise above (Jan 3rd). The original position was at the east blocking stone, northern row, that is seen in this photograph directly below the tv mast. 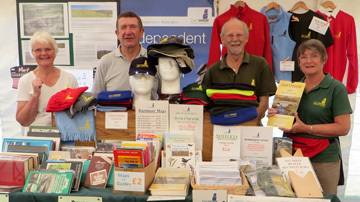 At top left is Hollow Tor. Just left of the far blocking stone with the sun above it is Yellowmead Farm. In front of the yellow farmhouse can be seen one of the old packhorse TA marker stones (Tavistock to Ashburton track) – more of which below. A view along the southern row, looking to the west (the northern row is behind). The double nature of the row is seen well here. The first, larger, stone in the row casts its shadow quite symmatrically onto the blocking stone at mid-winter sunset (solstice). 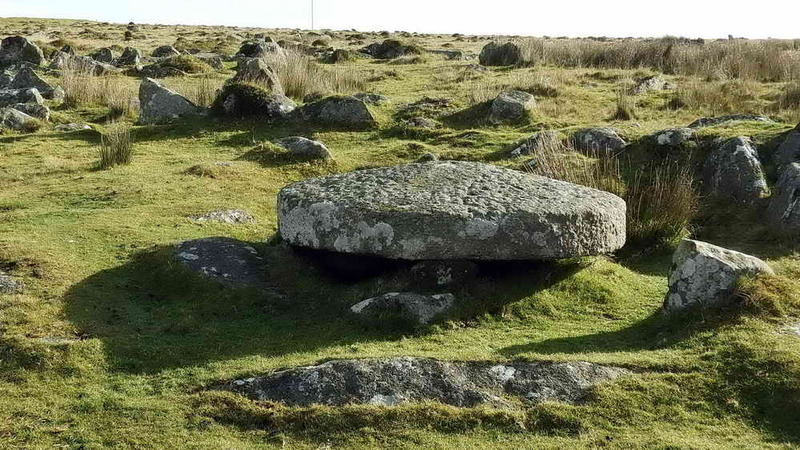 The large cist beside the southern row. “Cist” comes from “Kistvaen – a stone coffin, from the Celtic cist, a chest, and maen, stone, ‘v’ being used as a mutation of ‘m’.” . (Source: Crossing’s Guide to Dartmoor, 2nd edition 1912, reprinted 1990, page 22). 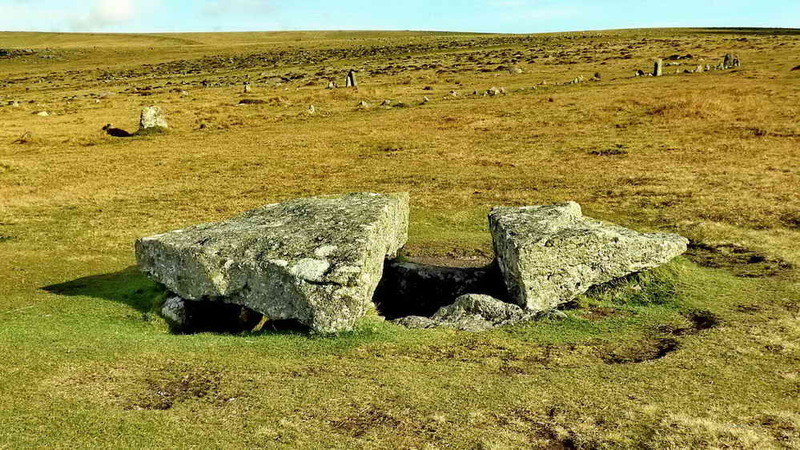 “The cist ……… appears to have been intact until 1870, when the huge cover slab was split across the centre to make a pair of gateposts, ‘by the occupants of the neighbouring public house’, according to Baring-Gould, and another was cut from the western side slab.” Source: Jeremy Butler, 1994, Dartmoor Atlas of Antiquities Vol. 3 – The South-West, 8. Merrivale ceremonial centre (Figs. 44.1-44.10), page 30. Sunset on 28th December 2016 – this is 7 days after the mid-winter solstice on 21st December. Shadow cast from the large cist south of the southern double row towards the blocking stone of the northern row (digitally highlighted). The blocking stone of the southern row is at the extreme right edge of the photograph. (digitally highlighted). Taken at 4.04 pm (15 minutes before 4.19 pm sunset). 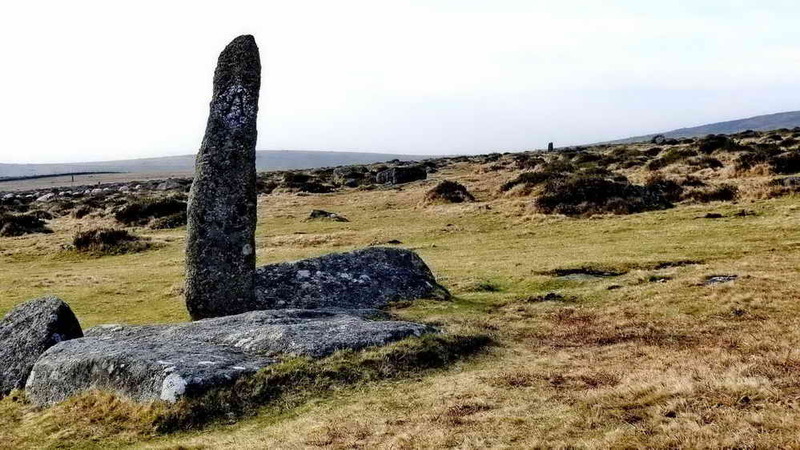 It is tempting to postulate that this might be the burial place of the originator of this monument that would have been so important to the Bronze Age farmers – knowing when to plant crops has always been important. The small cairn / cist in the southern row, someone important was buried here? The west end of the southern row, looking east. Four Winds (with the trees) can be seen in the distance. 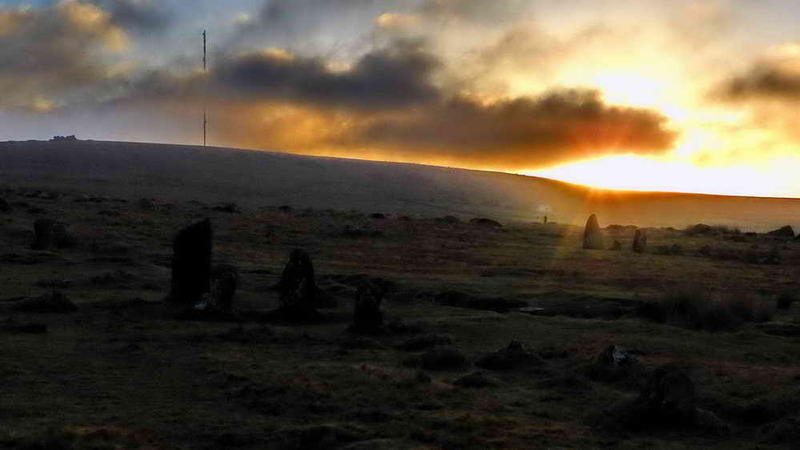 It is over these two stones that the sun sets on the shortes day when viewed from the west end stone of the northern row – see next three images …..
SunCalc image showing the minute of sunset on Dec. 21, winter solstice, at the west end of Merrivale stone rows. 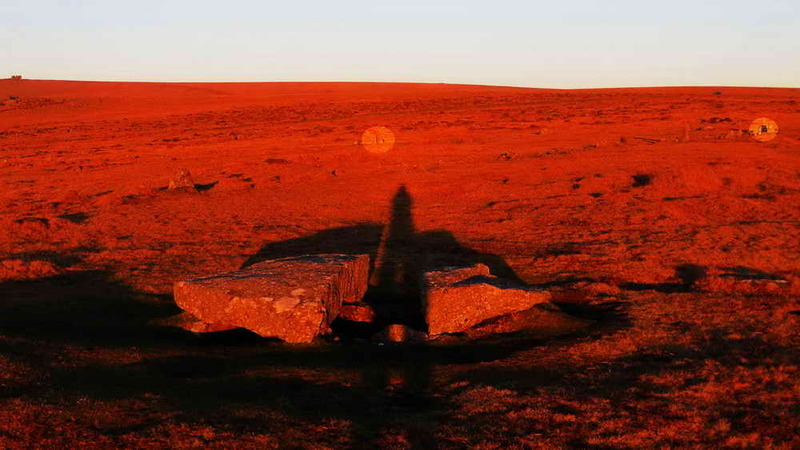 The red pointer, the “centre” of the display is placed over the (west) blocking stone of the southern row and as the sun sets, the stone casts its shadow straight towards the (west) blocking stone of the northern row (in the white circle). This northern row terminal stone is quite diminutive and perhaps a real blocking stone has been removed. 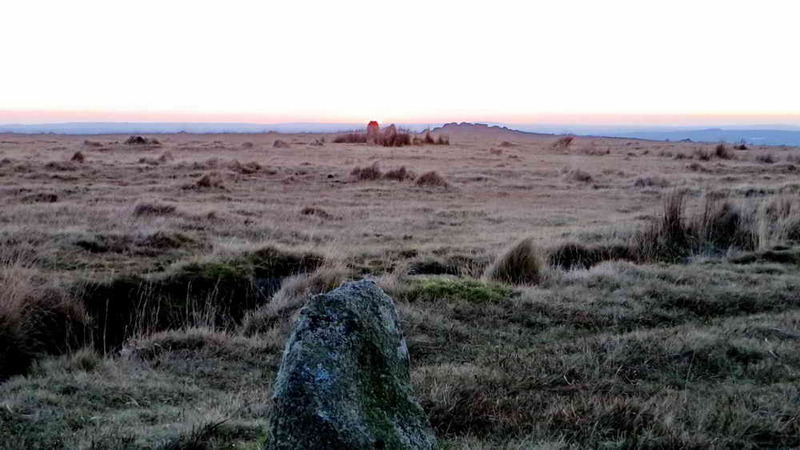 Photograph taken at sunset on 28th Dec. to show the western blocking stones of the southern row – they feature in the next photograph, where the sun set directly over the prominent stone. 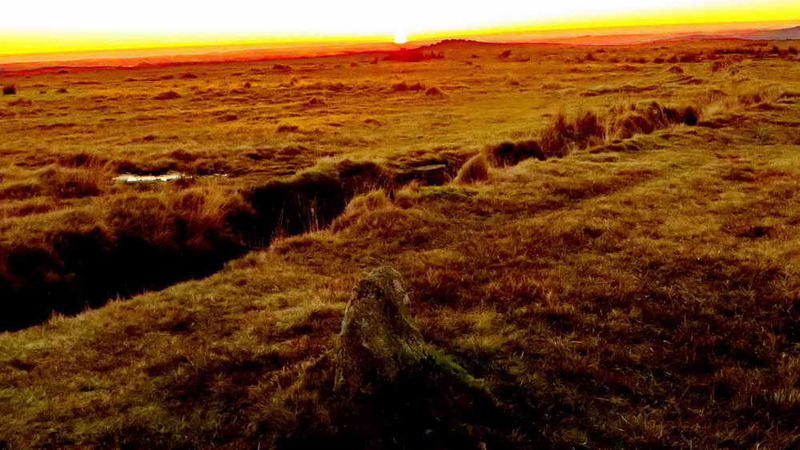 A week after solstice, this is quite an impressive alignment of stones that were put here 3,000-5,000 years ago to foretell the seasons for the early farmers …..
View from the western end of the northern row to the western blocking stones of the southern row – the sun is setting over a clump of rushes with the blocking stones of the far row almost hidden. 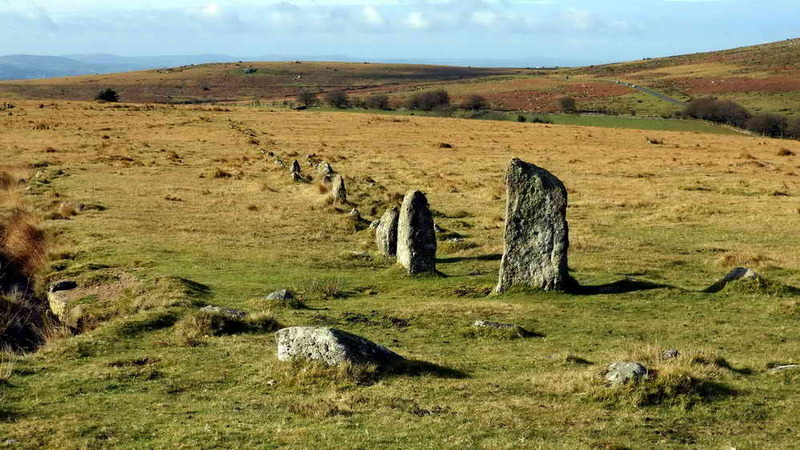 Merrivale stone rows, showing the vectors for the solstices and equinoxes. 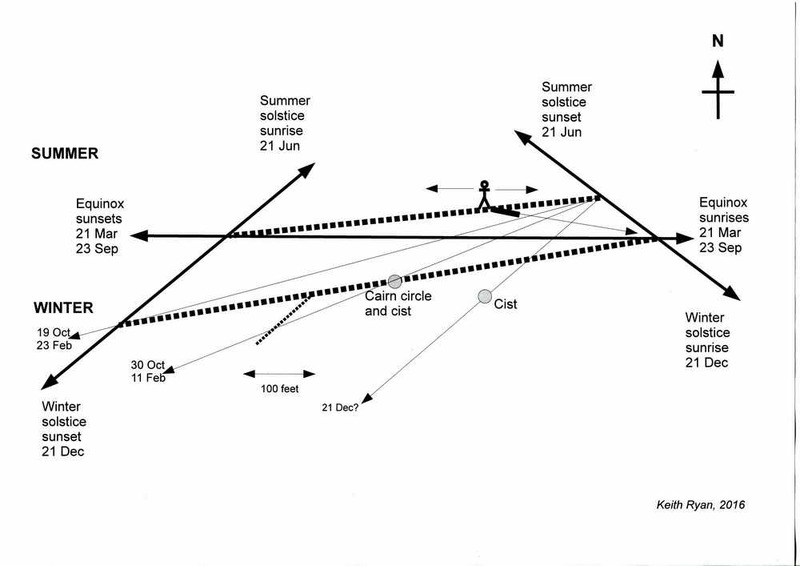 Figure redrawn with additional information from Jack Walker’s Dartmoor Sun (2005), Halsgrove Publishing, page 103. The chart above was prepared by plotting shadows cast from the southern row east blocking stone toward the northern row, using SunCalc.net and Suncalc.org from Dec. 21 to Mar. 21 at weekly intervals. The results i.e. locations along the row, can be reversed for Apr. to Jun, and then used again for Jul. to Sep, and finally reversed for Oct-Dec. The course of sunrise and sunset traversing the ends of the rows is a dynamic situation. 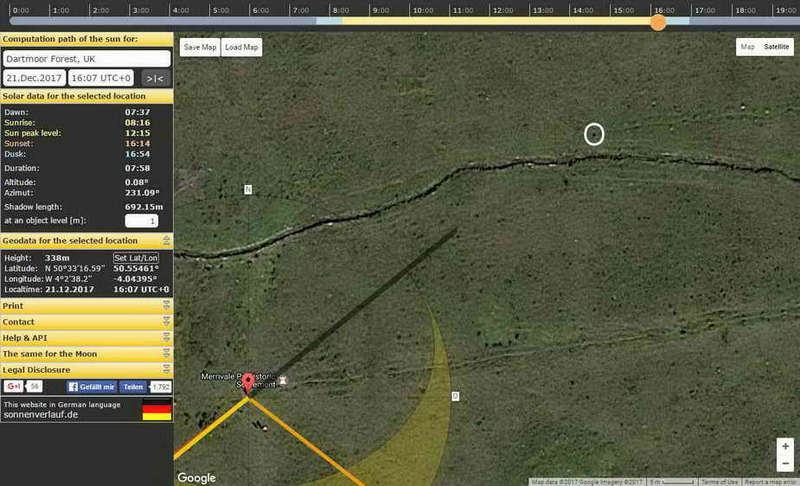 As the sun event reaches the end of the row, the difference in location speeds up – there is no simple linear scale. 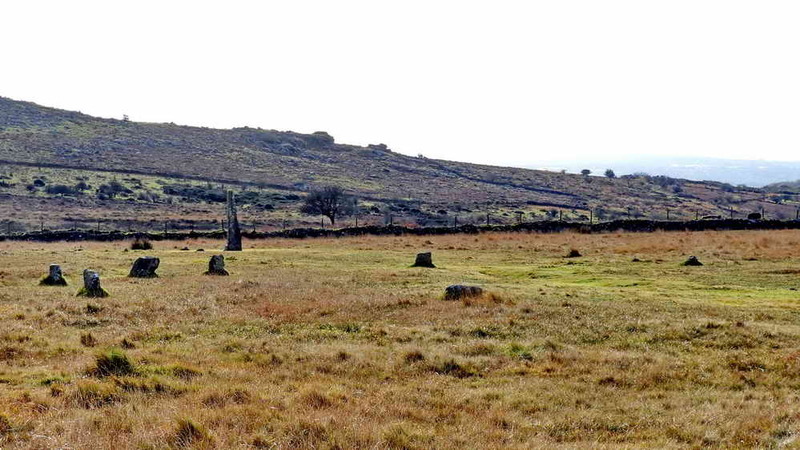 A view of the Merrivale stone circle and menhir. 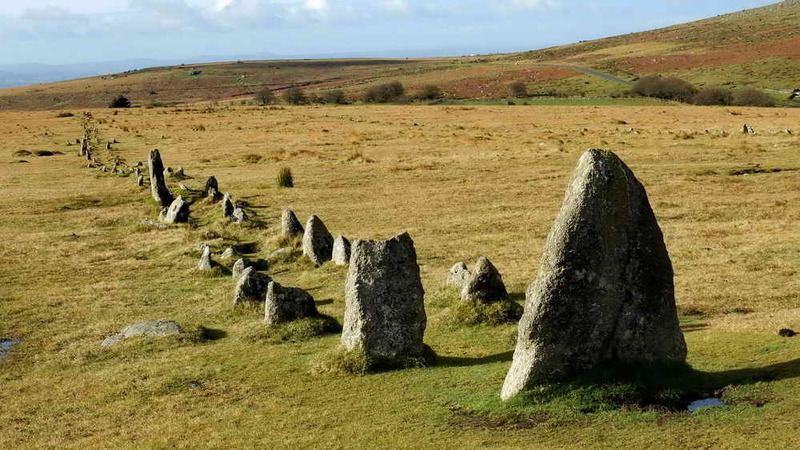 “Menhir” is derived from two Celtic words: maen = stone and hir = stone, another name being a longstone. 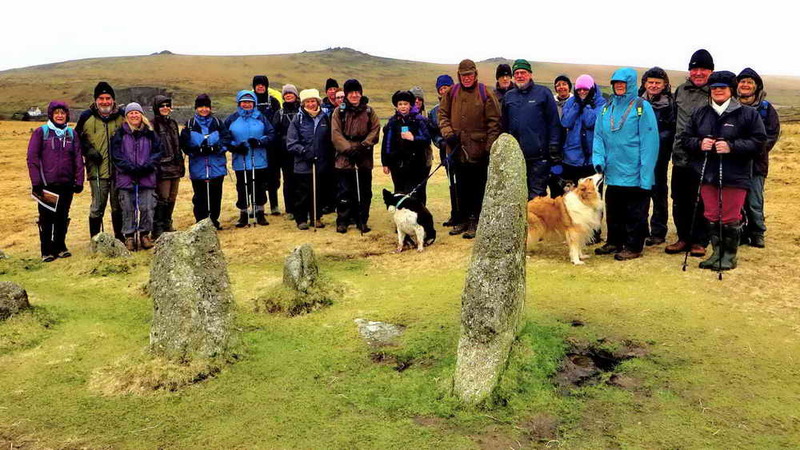 Another view, with Great Staple Tor (left) and Roos Tor (right) …..
DPA members and friends at the menhir. T-A marker stones along the Ashburton-Tavistock Packhorse Track. In the photograph above, a portion of the pillar has been enhanced to better show the “A”, facing towards Ashburton. In the Middle Ages,this trading route was very important, especially for wool and cloth or yarn, going via Sheepstor – which was famed for its sheep and wool. The track was superseded by the turnpike road in 1792. Strangers to the moor often had to tackle this high lonely route, this section over the Princetown area was the highest part and the most exposed. Princetown, or Thomas Thyrwhitt’s “Prince’s Town”, did not exist in those days. Guide posts were erected along the way and these we see today are possibly the more ‘modern’ (1669) improved series – sponsored by Plymouth Corporation – at the princely sum of £2. No doubt some of the ancient guide posts, now forgotten or lost, were turned into gateposts. 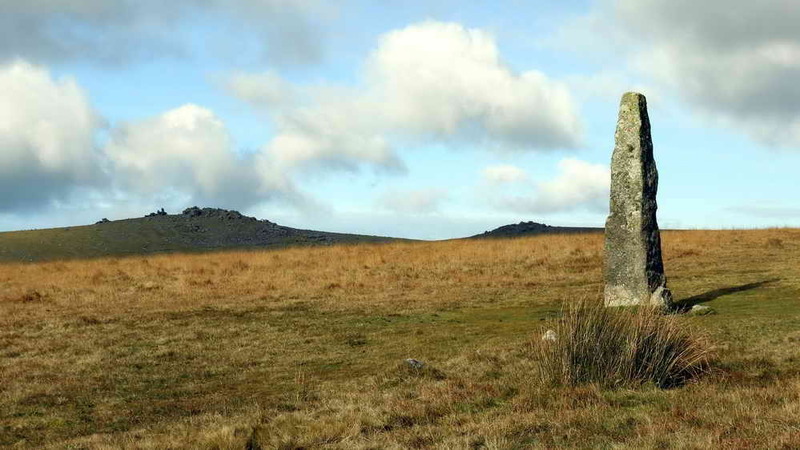 This track is described by Eric Hemery (1986), Walking Dartmoor’s Ancient Tracks – A guide to 28 routes, Robert Hale, London, 10: Tavistock-Ashburton Packhorse Track, pages 109-122. Looking over the wall at the back of the Four Winds site, over a “pinch” stile that was to keep sheep out of the old school grounds, onto the Long Ash Leat that runs down between the stone rows and then takes water to Long Ash; built in the 1880’s. .
Four Winds was the site of Foggintor School, built 1914, opened April 1915 with 55 children from the nearby cottages associated with Foggintor and other quarries. Mr & Mrs Stoyle were the teachers, it was a spacious building with a wood block floor and central heating – the pipes were used for warming their pasties! There were periods of closure due to snow and whooping cough. The garden had bees, poultry, a goat and rabbits. Besides the school building there was also School House, for the teachers. One section of the enclosure was the playing field. The school was run throughout its history by Fred Stoyle, the youngest head-teacher in the country. Their son, Ivan, planted the Christmas tree from 1924 in the school garden and this is the tree that stands there today – 94 years old (at Christmas 2016). After the school closed in 1936, the teachers’ house was renamed “Four Winds”. The school buildings were demolished in 1964 and the private house in 1965. 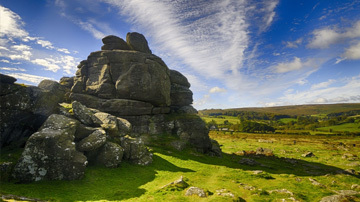 Stone from the buildings was used in the road modifications at Devil’s Elbow near Princetown. From this, we know that the tree is in the old garden and the other enclosure used to be the play area. Before Foggintor School was built, there was another school opposite the entrance to the track to Yellowmead. This was in the Foggintor Mission Hall, built in 1887. It served also as a school from Aug. 1896, opening with 41 pupils. It had 95 pupils in 1903 and closed in Sep. 1912. The building was demolished in 1965. The numbers of young children give some idea of the population in the area, associated mainly with the busy quarries. 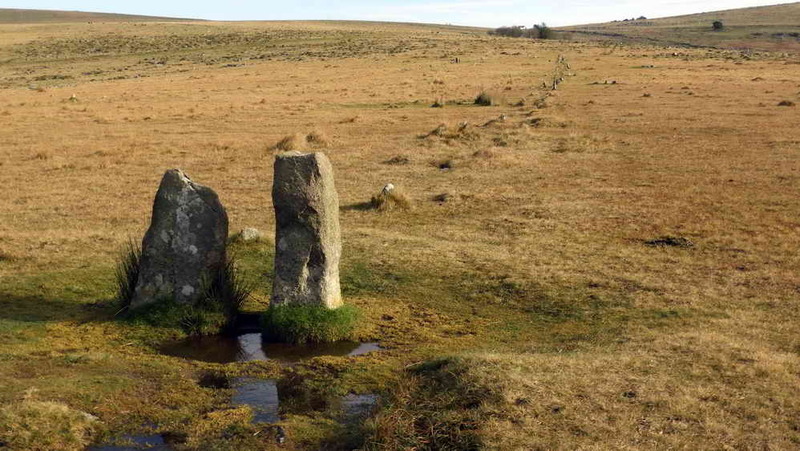 Links to the external Dartmoor CAM web site …..
More photographs from this Merrivale walk- CLICK HERE. 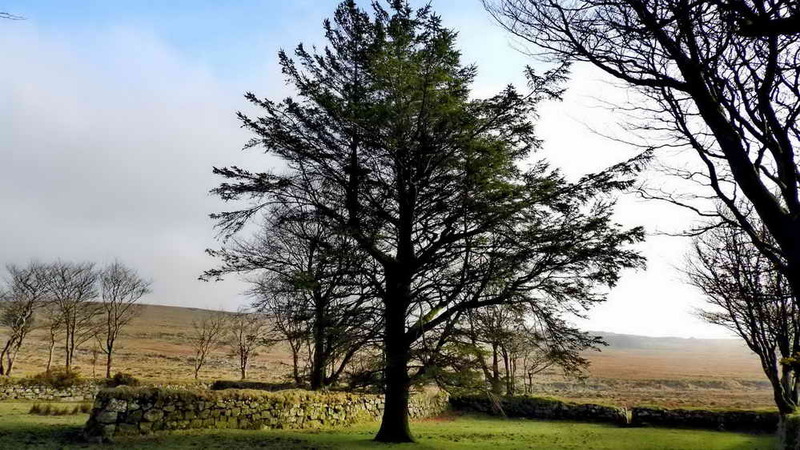 For photographs taken around the winter solstice – CLICK HERE. 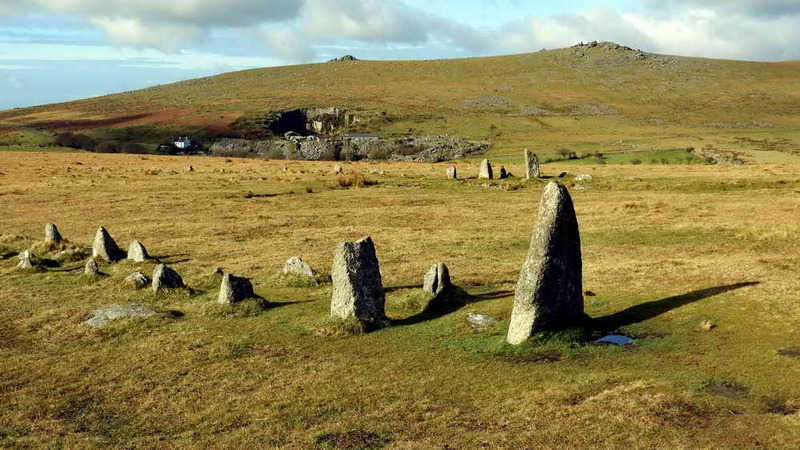 For an explanation about the how the stone rows work as a sun calendar – CLICK HERE. 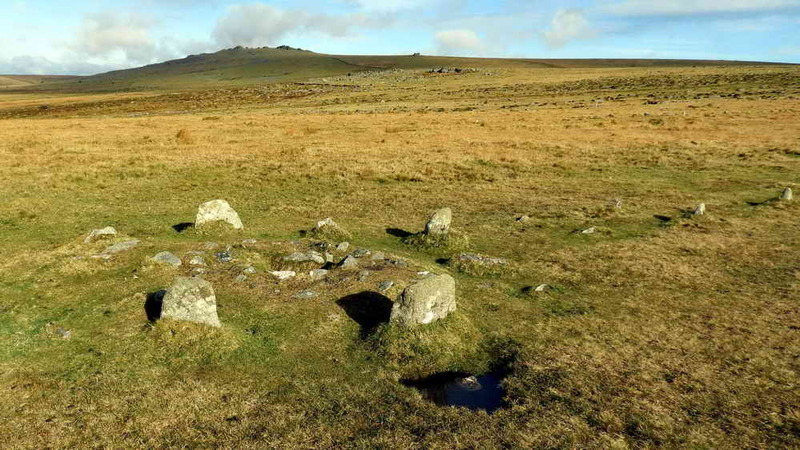 I was originally inspired to think about Merrivale after reading Jack Walker’s book, Dartmoor Sun, published in 2005 by Halsgrove Publishing. I bought it in about 2010 and read it avidly. On looking at it again, since I wrote this page, I see now that he has more use for the southern row than I have given it – I only used the two end blocking stones! I have concentrated on the northern row because it seemed simpler and also I didn’t really understand some aspects of the swap-over between the rows involving the equinoxes. As the publisher says in the Foreward to the book, Jack Walker is an engineer and brought an engineer’s mind to the problem. I was a biologist who spend his career in electron microscopy and x-ray microanalysis, looking ever-closer into things. I sometimes took a long time to step back and see the wood for the trees. The same has happened here – I was looking for the organelle structure within the cells and neglected to ;look at the forest again. However, it all seems to work either way, and with both direct observation and the casting of long shadows! I can only marvel that Bronze Age people, over 4,000 years ago, were capable of such concepts, planning and execution – it must have a few years of observation and preliminary marking out the ground before the final building of the rows.